Coffee mousse: how to prepare it in just 5 minutes with only 3 ingredients, it’s magic! A special trick to make an easy and tasty dessert. Beat the water, instant coffee, and sugar. In 5 minutes you’ll have a wonderful coffee mousse! Ingredients: for the chocolate cups: dark chocolate, as needed; plastic cups. For the coffee mousse: 3tsp instant coffee; 7 tsp sugar; 120ml water. 1) Wash and dry the plastic cups, cut one side and seal it back up with some tape. This will make removing the chocolate cup from the plastic much easier. 2) Melt the chocolate in a double boiler or in the microwave. Pour it into the plastic cups. Freeze for about an hour. 3) In a bowl, pour cold water, instant coffee, and the sugar. Beat for 5 minutes until it becomes a thick cream. 4) Remove the chocolate cups from the plastic cups. 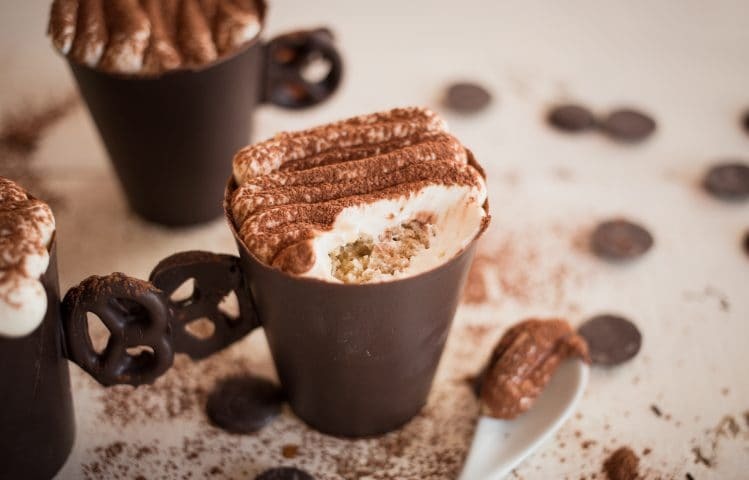 Serve the coffee mousse in the chocolate cups. We suggest you these tasty cups too. Ingredients: 2 cups dark chocolate; 1 cup mascarpone; 1 white cake, cut into circles; ½ cup cold coffee; 3 chocolate covered pretzels; cocoa powder. 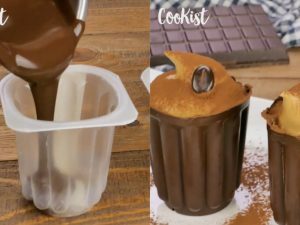 Melt dark chocolate and pour it into a cup. Tilt and rotate the cup to cover all sides evenly. Let the chocolate set in freezer. Remove paper cup. Dip chocolate pretzel in some chocolate and make a teacup handle placing it on the side of the cup. Put 1 cake round in, pour some coffee on top, add cream and repeat until cup is full. Decorate with cocoa powder sifted on top. 3 edible cups you'll love! Puff pastry spoons: a unique, easy to make starter!